All knitting and assembly is complete. Only need to weave in ends and figure out buttons. Might need B’s insight on the buttons, since the vest will go to her. I think it turned out well, despite many false starts. So, B’s vest has the knitted pieces assembled, and all that is left is the band around all the edges. I wanted a more substantial trim (so I thought), so I knit a band that could be folded over. Not only am I going to run out of grey, but I don’t like the effect – it is too bulky and is probably not going to lay right. Before ripping out all the trim on the front, I thought I would try other options on the armscye. First, I tried alternating colors (orange and grey), but that looked muddy. Second, I tried using both colors at once, which looked interesting, but was too bulky. This is my third option, which is just one strand of the grey, in a garter stitch. I think that is the winning option – I should always remember that simplest is best. So…. I’ll finish the armscyes and then rip out the band and try again. It seems I’ve done a lot of ripping on this project – fortunately, the yarn is very sturdy and very soft. You can see that the front band doesn’t lay flat and the bottom band pulls the sides. Only the armscye band is behaving. Fortunately, the soft alpaca yarn is easy to knit – and easy to rip – and holds up well. Next – blocking and assembly. I’ll also test-fit the vest on my trusty Miss Missy dressmaker form. There might be a place for an under-arm panel . Final step will be picking up and knitting a band around all edges and adding buttons/button holes. Blocking. The pieces you see are heavily pinned into place for shaping and sizing. This has not been blocked yet, and if I remove the pins, the pieces will curl up into tubes. Assembly. There is a definite pattern to match. I’ve tried to be very careful to keep consistent with the pattern as I knit, knowing that I’ll need to match the pattern at the seams. Band. I really dislike picking up and knitting, and I’ll need to decide how to approach this – “long-wise” (meaning picking up around the entire perimeter), “as-I-go” (meaning picking up and knitting into the garment each row) or I-cord? My pin box is a York Mint tin which I’ve had for years, but ably keeps the pins enclosed when I drop the box. I’ve often remarked that my best friend, B, is kind enough to indulge me (and accompany me) in yarn store diversions. One our first “yarn store” outings was to a place in Noblesville, years ago (I don’t remember the name of the store). We had been discussing a vest for her, and she picked out this nice soft Alpaca yarn. There were problems that prevented me from tackling this project. The first was that my knitting skills were too novice to handle a garment. The second was that I wasn’t sure how to handle two colors (see “novice,” above). The third was that I had a lot of trouble finding a suitable pattern. I kept my eyes out for patterns – for years. Finally, I found a garment pattern that suited the style B requested, and I found a knit pattern that would make manageable use of the two colors – a modified herringbone style (K2, S1, with colors alternating rows). Unfortunately, the garment pattern and knit pattern were not on the same project, which required some tinkering. Because I was unsure of whether the knit pattern and vest pattern would work together, I started with a sample of comparable (but much less expensive) yarn, and was pleased with the result. Finally, I’ve started on the vest. Pattern is “Stylish” vest from Red Heart (Free Pattern). However, I’ve modified it, significantly, and pulled a vest pattern from my sewing supplies as a model. The gauge on the pattern is for a much heavier yarn, so the row and stitch count needed adjusted. The back is done, and I’ve started on the front, but am having difficulty with the point at the hemline (see the pattern image from the link above). I’ve started over about 5 times, but I think I’m getting a better grasp on what is needed. The yarn rolls a lot, so it could be a challenge to block and assemble. Fortunately, there is a band around all edges, which should help the finished garment. My best friend B has kindly indulged my knitting habit over the years (see previous posts), and on one excursion early in my knitting adventures, she purchased two skeins of lovely wool – one each in two colors – on the theory that I would knit a vest for her. At the time, I knew my skills were not up to the task (and I told her), and over the intervening years, I’ve kept a file of vest patterns that might meet her requested design. I’ve never found one that was “just right,” and I didn’t think my skills were up to the task of designing one. As I finished other projects, and perused my yarn stash for inspiration, I found “her” yarn and started thinking and looking again. I decided to experiment with two patterns – one for the two-color design, and one for the vest design. Something I rarely do (likely due to my general lack of patience), but which I am doing, now, is knitting a sample garment. I have similar yarn (different colors), and I am experimenting with the pattern. Below is my WIP – the back of the vest. Vest Pattern: Knit Vested & Stylish, free from Red Heart. Yarn Pattern: Robert’s Houndstooth Vest from Interweave Knits, Weekend 2009, available free through Ravelry. 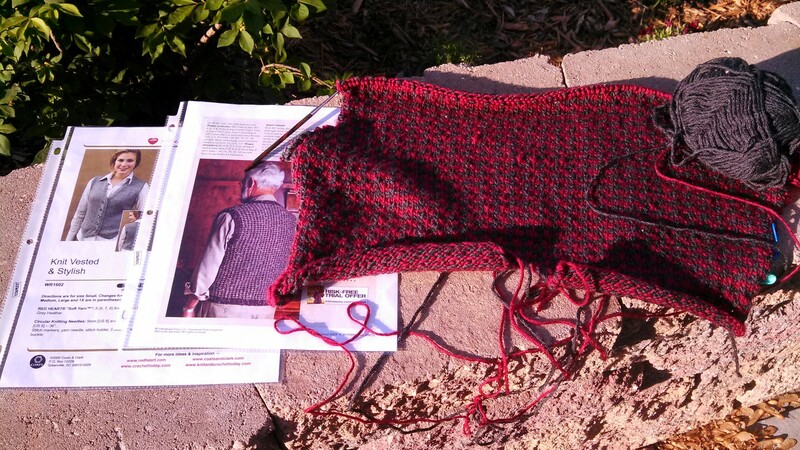 Main project challenge: Keeping the Houndstooth pattern on the front of the vest, where there are points and shaping. I think I have it worked out in my head, but this is why I’m knitting a sample garment – Not everything in my head works out as planned in real life.